Lightly beat the eggs trying to not incorporate too much air. Chopsticks are a perfect tool for this. Ensure that the yolks are completely incorporated, avoiding leaving bits of egg white in the mix. Add the mirin, sugar and soy and gently incorporate. Evenly spread a bit of oil in a square pan with a paper towel. On a medium low heat add the eggs slowly so that they cover the bottom of the pan, but not using all the egg. After about 2-3 minutes, the egg mixture will start to cook. They don’t need to be fully cooked, and should actually be slightly moist on top so that the egg sticks to itself when folded. Fold the egg over onto itself twice using a large spatula, or chopsticks if you have the skill, as you would fold a letter three times. Do not flip the eggs over like a traditional western omelet, just push them over to the other end of the pan. Use a paper towel to add more oil in the pan and add more of the eggs. Gently lift up the roll of previously cooked eggs so that they are on the edge of the raw eggs. When the new layer of egg is almost cooked, fold the eggs over onto themselves once again. Continue this until all the eggs are cooked. Wrap the rolled up egg in plastic wrap and using a sushi mat (if available), press the tamago roll into a rectangle shape. Let the tamago cool completely before slicing it. Your tamago will last a week if kept cool, but is best served fresh. It makes a great breakfast, dessert, or snack and is sure to impress your friends. 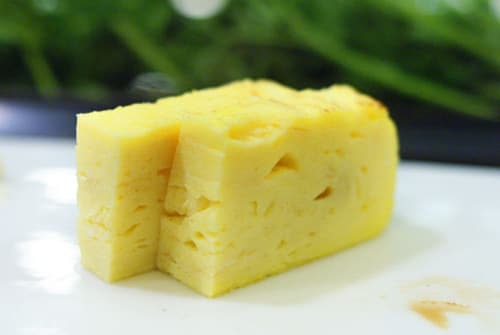 This is the traditional recipe for tamago, however is can be made by making sheets of cooked egg, layering them, and slicing into rectangles and serving. This method, however, ensures less waste, and produces a much better texture.